“Without A Clue” is one of my favorite movies of all time. Forget the fact that I am a Holmes/Watson fan; it’s just a great movie. 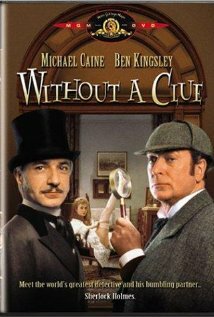 Michael Caine is brilliant as Holmes (well, brilliantly dim) and Ben Kingsley is superb as Watson. This is the “real” story of Sherlock Holmes. It turns out that the real sleuth in the team is Watson. The problem is that Watson was looking for an appointment to a conservative medical school staff and when he became involved with a Scotland Yard case attributed the solution to a mythical character, Sherlock Holmes. When people want to meet Sherlock he hires an actor (Michael Caine) to play the part. The phony Sherlock is a little dim, a drinker and a swordsman. There is the inevitable case with Moriarty, stolen Bank of England plates and dozens of great lines. Holmes: It wasn’t YOU he tried to kill! Watson: Think man; think…Who was supposed to be in that room? Holmes: That’s right. YOU were! Watson: Moriarty knows…I am the only match for his evil genius. Holmes: You mean he’s not trying to kill me? Watson: Of course not. He knows you’re an idiot. This kind of banter runs through the entire film. Of course both Caine and Kingsley turn in superb performances and the opening scene is somewhat taken from the canon. There are the occasional scenes of slapstick comedy but they are done in a way that they seem so probable. This is a must see movie for fans of Holmes and Watson. Kingsley plays Watson as a caring, adventurous, aggressive problem solver. Caine and Kingsley play well off each other and there is true charisma. I also have to give kudos to Pat Keen who played one of the best Mrs. Hudson’s ever. 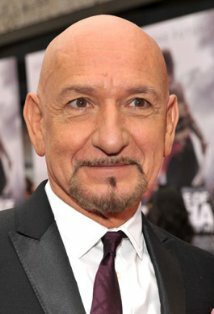 To do justice to Ben Kingsley’s career would take pages, but in short, he is one of the greatest screen actors of our time. He is also one of the greatest stage actors. Born 31 December 1943 in North Yorkshire, England as Krishna Bhanji he became internationally known for his Oscar winning performance as Mohandas Gandhi in the 1982 film. In the 1960s and the 1970s much of his time was spent in Shakespearian theater productions. In addition to an Oscar he has received BAFTA, Golden Globe and Screen Actors Guild Awards. He was also knighted in 2001 and got a star on the Hollywood walk of fame in 2010. Kingsley has been married four times and has four children. Some of the other great films he has appeared in include: Murderers Among Us, Bugsy, Schindler’s List, Sweeney Todd, Anne Frank and Prince of Persia. In fact he has 99 movie credits and seven more films in post-production. I concur re Jeremy Brett but I would put Edward Hardwick slightly, very slightly, above David Burke. Hardwicke and Burke are far and away the best Watsons ever, of course, though something ought to be said for Jude Law. And, in the new SHERLOCK, Martin Freeman is an excellent Watson, a full and fitting match for Benedict Cumberbatch, who is the only Holmes to come close to Jeremy Brett.